Just Jessie B: My Blog Turned One! & A Giveaway! My Blog Turned One! & A Giveaway! I can't believe it's been over a year since I started my little blog! To each & every one of you who has supported my blog in any way, shape, or form... A "like" on Facebook, reading my posts, commenting, sending me e-mails, joining me on Instagram or Pinterest.. THANK YOU! Being creative & having the opportunity to share it with you all has added so much joy to my life~ and I cannot thank you enough. I hope to stick around, as long as you guys keep coming back for more, and continue to grow my passion for living a healthy lifestyle through sharing recipes, tips, and lots lots more! I truly appreciate the opportunity to help anyone I can become a more happy & healthy person through simple diet & lifestyle changes. To express my gratitude, I am doing my second giveaway here on my channel-- in honor of my "one year anniversary". As most of you know, I have been loving the "Paleo Wraps" from Julian Bakery (see their products at http://julianbakery.com or check your local Whole Foods). I've gotten a great response to my Paleo Breakfast Burrito recipe & various wraps I've shown on Instagram, and have loved getting creative with different ways to use them (check back for a new recipe soon!). So, I asked if they would help me out with a pack to give away for one of my lucky viewers to try, and of course they said yes! Pretty cool, right!?? On top of the Paleo Wraps, I went out and chose a few other products that I love- and think you will too! 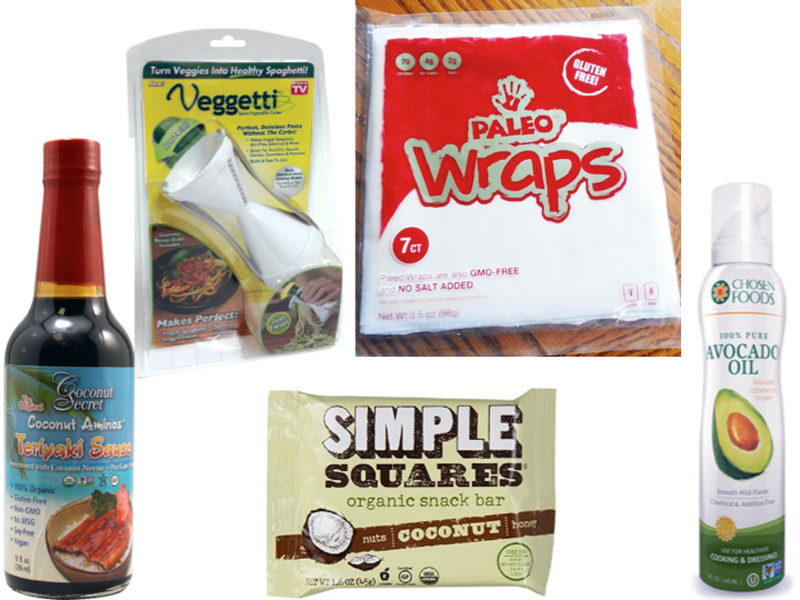 A kitchen gadget, a tasty snack bar, a delicious sauce, and a high-quality cooking spray~ all great products to try out for anyone, but especially my Paleo friends! To enter the giveaway, all you have to do is: 'follow' my blog through Google Friend Connect (find this to the left, below my picture & about me) and leave a comment on this post, telling me what you would like to see on my blog in the future. It could be a recipe idea, new type of post, question you would like answered, video request, anything! I can't wait to hear some feedback from you guys, and am really excited to share some of my favorite things with you! Please enter by Sunday, August 24, at midnight. Then, I will randomly generate a winner, and contact you ASAP to send your box! Winner will be announced on Monday! P.S.~ I have a new button to the right, with a purple header, that takes you to my brand new Amazon store-- where you can shop my favorites! Go check it out! & Don't forget to come find me on Instagram where I'm always posting my newest foods & finds. Hey Jessie! I recently started paleo and after finding your blog via instagram it has become a big help to my diet! I LOVE your one pot meals! More of those would be great! Your beef enchilada bake and your paleo pizza balls (which I've sort of made into a casserole myself) have become little staples for me. I've definitely tagged you on instagram a few times. (Lianslo) Glad you're celebrating your 1 year and keep doing what you're doing! Hi Jessie! I found you through Instagram and am loving looking through your archived recipes. With fall approaching I would love to see recipes for soups and stews - warming comfort foods. Really enjoy all your pictures! I love your IG and blog! I am a newbie to paleo and blogging as well. I would love to see some fall recipes, including pumpkin or crockpot. I can't wait to try so many of your amazing paleo recipes! Love your blog and look forward to what's here in the future! Congratulations on a fun first year. Hi Jessie! Congrats on a year! Made the lemon Lara bars and they were awesome! I want to try coconut next!! Hi Jessie! Congrats on one year! I love looking through all of your recipes! I have been gluten free for almost 6 years(this November), but I love looking for inspiration for new recipes. I love how you combine comfort food/guilty pleasures, but make them healthier! I can't wait to try some of your recipes! So proud of you, and all you do! This has probably been the busiest past year, with all you had going on with school and life! I'm glad you have found such passion in sharing all that you do on your blog. Can't wait to see what you have in store for us next! I especially enjoy your paleo tips and recipes. What a great idea! I am a new follower but I have tried almost all of your recipes and have yet to be disappointed. I'd love to see more fall friendly and crock pot friendly recipes. I have said this before, but keep doing what you are doing. I love your blog! I'd love to see what you do for exercise! Especially on such a busy schedule. I'm so proud of you Jess.! I hope your second year is as successful as the first! I am happy to see that your blog is succeeding! It looks like you put a lot of thought and effort into your recipes. They all look delicious! I'm so happy you decided to start this blog. You've inspired me to always eat healthy and to see how easy it is to do so. Keep up the great work and I can't wait till your beef stew recipe is posted! Congrats on your blogiversary! I've really enjoyed all your recipes that I've tried and look forward to more tasty ones in the future! I would love to see healthy freezer meal recipes. I am fairly busy during the school year and love to use my slow cooker for the week nights. BTW, I love your blog and congratulations on the passing the first year mark! An update from the lucky winner: These products rock! I would highly suggest purchasing all of them. I just used my Veggetti this evening for dinner was extremely pleased with the quality of my zucchini noodles. The spray avocado oil is extremely handy-especially when baking egg muffins for weekly breakfasts. THE WRAPS! Oh, the wraps! So good. I will be ordering more of them when these run out. I am saving the simple squares and teriyaki sauce for a later date, but I can only imagine how great they will be based on Jessie's other recommendations. My tummy thanks you! Hi Michelle!!! Sorry for being so late to get back to you, I haven't been getting blog updates on my e-mail for some reason! But, I am so happy to hear that you are enjoying your goodies! Congrats on being the big winner, and thank you so much for coming back to share!